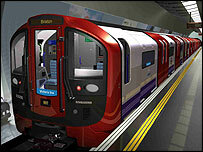 Work has begun on the construction of 47 new London Underground trains to improve services on the Victoria Line. The fleet, which has eight carriages per train, marks the first phase of a £3.4bn investment to upgrade the line by private company Metronet. It says as well as the trains, a new signalling system will mean a faster and more frequent service on the line. Metronet hopes to have two trains in service by early 2009 and the rest of the fleet will be delivered by 2011. David Crawley, the company's managing director, said: "This is a significant milestone in the massive investment that Metronet is making for the Tube network. "The arrival of new trains and signalling are key components in the wider upgrade of the Victoria Line." Metronet claims trains will be capable of operating at a higher maximum speed, and with faster acceleration, enabling station-to-station times to be improved by up to 10%. The new fleet of trains - being built by Bombardier UK - will also be larger, with 43 trains available for peak service, compared with 37 at present. Metronet was granted the maintenance contract in April 2003 to look after two-thirds of the London Underground network.